September 23, 2009, British adventurer, David Hempleman-Adams was successful in his attempt to set a world record on Sunday by flying over the fields of Maize, Kansas in the United States in his miniature gas balloon. Hempleman-Adams set two world endurance records, the first record was in the AA-01 class balloon, which had stood for more than 26 years in which the balloon was in the air for 8 hours and 12 minutes, Hempleman-Adams flight lasted 14 hours. The second broken record was was for having a bigger AA-2 class balloon. Coy Foster, an American had held the record of 8 hours and 12 minutes when he flew over Texas in May 1983. Hempleman-Adams flew more than 200 miles from Butler, Missouri, to Cherokee, Oklahoma. The area in which Adams was flying, was in an area that had thousands of turbine windmills on the ground throughout his flight path. David Hempleman-Adams was born 1956 in Swindon, Wiltshire. He is the first man in history to reach the Geographic and Magnetic North and South Poles as well as climb the highest peaks in all seven continents, a feat he christened the Adventurers' Grand Slam. In 1984, Hempleman-Adams successfully completed a solo expedition to the Magnetic North Pole without dogs, snow mobiles or air supplies. Also he led the first team in 1992 to walk unsupported to the Geomagnetic North Pole. In 1996, he completed a solo unsupported expedition to the South Pole on January 5th, sailed to the South Magnetic Pole on February 19th, and led a team of novices to ski to the Magnetic North Pole on May 15th. In 1998, Hempleman-Adams joined with Norwegian, Rune Gjeldnes, to attempt to reach the Geographical North Pole, the final leg of his Grand Slam attempt, which he described in a book called Walking on Thin Ice. He also became the first man to fly a balloon over the North Pole in 2000, a trip that emulated the ill-fated attempt by Salomon August Andrée, a Swede, to fly to the North Pole in the 19th century and which he also described in a book called At The Mercy of the Wind. Hempleman-Adams has made seven Arctic expeditions. On September 22, 2003 he became the first person to cross the Atlantic Ocean in an open wicker basket hot air balloon. The journey was from New Brunswick, Canada to Ireland. In July 2004 Hempleman-Adams and co-pilot Lorne White flew a single engine Cessna from Cape Columbia in the north of Canada to Cape Horn at the southern tip of South America, covering 11,060 miles and arriving on July 23 after 12 days. In June 2005, Hempleman-Adams staged the world's "highest" formal dinner party. 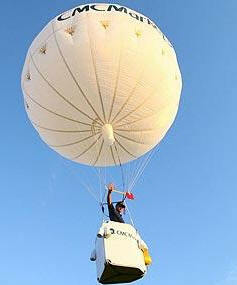 Hempleman-Adams, Alan Veal, and fellow adventurer Bear Grylls ascended to 24,262 feet in a hot air balloon. Grylls and Veal, wearing formal attire, then climbed down to a dinner table suspended 40 feet below the balloon and dined on asparagus, salmon, and summer fruits, and finally parachuted down to earth. Hempleman-Adams daughter Alicia Hempleman Adams became the youngest person to traverse Baffin Island in April 2005. In January 2007, Hempleman-Adams broke the quarter-century old world small sized hot air balloon altitude record, by ascending to 9,906 meters over Alberta, Canada; beating the previous record of 9,537 meters set by Carol Davis in New Mexico. In July 2007 Hempleman-Adams crossed the Atlantic in a small helium balloon to break the record for that particular class of balloon flying this distance. On October 10th 2008, Hempleman-Adams, along with co-pilot Jon Mason won the 52nd Gordon Bennett Cup, having flown a helium balloon from Albuquerque, New Mexico eventually landing over 1000 miles later near Madison, Wisconsin. They are the first British team to win the coveted prize in 102 years.